Heading into the final shopping days before Christmas, a toy race track created by an Iowa inventor is named to a national magazine’s list of top toys. Better Homes and Gardens placed BluTrack, based in Pella, on its best-rated toys chart, tested by a special child panel. Randy Belding, BluTrack’s president, is thrilled with the top-25 ranking. Belding says: "We’re pretty excited about that. We’ve won some awards in the past but I don’t think anything is even close to the recognition that you would get from an organization like that. The testing was done by children, and when children make the decision, it always makes you feel pretty good about your product." Belding, an Independence native who lives in Pella, says he created the original dual-lane race track for his two children, and when other kids from the neighborhood flocked in and started requesting their own tracks, he knew he had a good idea. "Everybody we’ve talked to in the toy industry said ‘It’s over-engineered, you can’t make it in the U.S., you’ve gotta’ go overseas,’ and we know we can do it and the reason we can do it is it’s designed different. The customer is responding to it and it makes us feel pretty good," Belding explains. 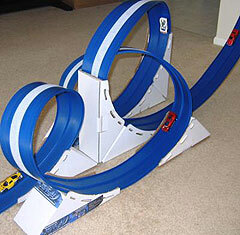 He says his son was frustrated with a traditional toy race track because his cars wouldn’t make it through both loops as advertised, plus, you couldn’t race cars side-by-side. Belding and the boy headed for the garage and created what was to become BluTrack. Belding says: "He was done and quit and went on to do something else and I thought, ‘Man, this stinks.’ We spent 20-25 bucks on a toy and he played with it for maybe 30 seconds. Then it dawned on me. He got a lot more fun out of designing it than he did actually playing with it. That was kind of the moment where I said, ‘Okay, we can just design something better.’"
Belding, a University of Iowa graduate, says he’s prepared to deal with the deluge of toy buyers in the remaining few weeks before Christmas. He sells the track kits through independent toy retailers in several states, including a store in Iowa City, or via their Blutrack website .